I've frequently heard that your income will rarely vary more than 10% from that of your 5 closest friends. This doesn't terribly surprise me because people tend to hang out with other people of similar income levels, but I recently realized there may be more to it than that. I was talking last night to Amanda about churches and she was repining that so many of our fellow congregants complain vocally about their financial woes and how they are struggling to live paycheck to paycheck, but don't consider selling their leased SUV, dropping cable TV, pulling their kids out of expensive childcare, or having their husbands brown bag it to work. This affects her because she finds herself wishing she could have the luxuries that they have, but also seeing the problems it causes them. I commented that we could never find a community that coincided perfectly with our beliefs and values and her response to that was "I know there's no grown up WCF (our college ministry) out there." That wasn't what I meant, but it's a fascinating retort because it is so close to what I meant. My 5 closest friends are all people I met in college. I think our incomes probably differ a bit more than 10%, but it's the similarity of our philosophy and habits that I find so interesting. That we agree on things we dealt with in college is somewhat unsurprising, but so many of the things that we didn't are similar as well. I'm not going to claim that my friends all agree on everything. One couple likes buying new cars, which I think is a generally bad financial decision, but none of them finance cars. Only 10% of the general population buys their cars outright. One couple has significant investment debt on real estate, but none of us have any consumer debt. 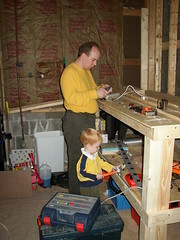 We disagree on some aspects of home schooling, but we all, along with 2% of the population, plan on doing it. What is it that brought us together that causes us 10 years later in a totally different stage of life with entirely different problems to still follow such similar paths? We are all Christian, but I've met many Christians I don't have the same philosophy as I do. We are mainly engineering type people, but again I've met other computer people who differ from me. The other day I was working on getting my car fixed and Andrew comes up while I was under it and asked "Daddy, is your car broken?" I said yes. He said, "Can We Fix It?" Andrew: Is the toilet broken? A: Why don't you fix it? Me: I need a toilet auger and I don't have the tools. A: Go to the garage and get the tools. Sometime last week I came across this post on mortgage debt and financial risk, then a few days ago at dinner my mother-in-law was talking about her conversation with a so-called "Crown Ministries Guru" who was evidently rather condescending to her about her desire to liquidate an investment account to pay off a (lower interest) HELOC. She argued that paying off the loan is the only biblical option; he argued that it didn't make sense. I find both of these positions interesting, but the case of the guru more than the blog poster. With respect to the blog, John argues that he is reducing his risk by having a mortgage on his house and having that money invested somewhere else. Presumably he has it in a non-insured investment since most people with this theory seek to make greater returns on the investment than the interest on the house and you're not going to get a CD or insured bond with a better return than your mortgage interest or the banks would lose money (which banks don't like doing). So his theory is that if the market for your individual house drops you've lost tons of money on your house but he has his money better diversified. The first problem with this is that if his investment drops at the same time that he loses income he might lose his house; if the housing market is down at the same time he might even lose it at a loss. You will never lose a paid off house unless a judgement is delivered on some unrelated debt (or the government decides they can get more tax money from somebody else, but that's an unrelated issue). Trent (the author of "The Simple Dollar") argues that he is ignoring this personal risk but is correct about diversifying his financial risk. He's not. Lets say that John and Tristan both have $100,000 homes. John takes out $80,000 of that and puts it in a guaranteed bond and Tristan has the house totally paid off. Both of their houses are in markets that go in a huge slump and the house price drops to $60,000. Tristan now owns a $60,000 asset (a house). John now owns a $60,000 asset with an $80,000 lien on it plus a second $80,000 in the bond, bringing both of their net worths to $60,000. It may be true that John makes more money because his outside assets he leveraged the house to buy make more money than the interest on the mortgage, but it is never true that he has reduced his risk. The same thing goes for any investment made with other peoples' money. You can make huge money buying commodoties on margin, but you can also lose your shirt. Taking out a loan and investing it can only increase your risk because you have a loan that must be repaid and an asset that you might be able to recover. Even if it's insured you're not really guaranteed you'll collect in a timely manner. Now we get to my mother-in-law's question. Her assertion something along the lines of that if The borrower is slave to the lender, and You cannot serve two masters and that she should Leave no debt outstanding, except the continuing debt to love one another. Then it would seem unbiblical to keep debt, certainly when you can pay it off. Proverbs certainly teaches us it is unwise to be a man who strikes hands in pledge or puts up security for debts. I've taken Crown Ministries and considered taking the class to be a teacher and I'm pretty sure that it is totally contrary to the tenets of that program to argue that if you have given a pledge to stranger you should do anything but deliver yourself like a gazelle from the hunter or a fowl from the hand of the fowler. I asked her what biblical insight he provided and she said he only said that it would be foolish to keep put money in an account that gets less interest. My only response is that the foolishness of God is wiser than men. Having said that, I'm probably about to put money in an investment account rather than pay off my mortgage, so I'm not saying keeping your mortgage around is always a bad idea. I'm not a die hard Ramseyite. I have personally paid off my student loans, for instance, but I can see that keeping them around at 3% interest (which I know exist) and sticking the money in an FDIC insured savings account with total liquidity and 5% interest makes financial sense. I wouldn't do it because I like my finances boring, but I don't think it's a bad idea. My situation is that I know my car is going to die and I'm going to need a new roof and new siding in the next 10 years so I need to build up enough liquidity to take those hits without having to get another loan which is almost certain to be worse than my current 5% loan on the house. Thus my money will not be going to paying off the home early, it will be going to a semi-liquid fund for pending expenses. I want to escape that house debt, but I also need liquidity and a wise man plans for the future.